Aviram Tamam with his first single: "Almost Nothing Remains"
Avriram Tamam (24) was born in Bat Yam to a typical non-religious family. When he was three, he caused the family to make a dramatic change in their lifestyle. While the family was sitting together watching television, Aviram began to play with the shining, talking big box until it fell on his head with the glass screen shattering into sharp fragments and the little boy's blood sprinkling the stone-tiled floor. He was rushed to the hospital in critical condition. His distraught mother vowed that if he comes back to the living, they will keep television out of the house and start to keep the Sabbath. From then on, Aviram grew up as a religious boy and was educated in Charadi schools. As a teenager he underwent a dark period where he questioned his beliefs and stopped being religious. After a deep, sometimes agonizing, personal search for himself, he was exposed to the world of music from which he found his way back to his religious roots. 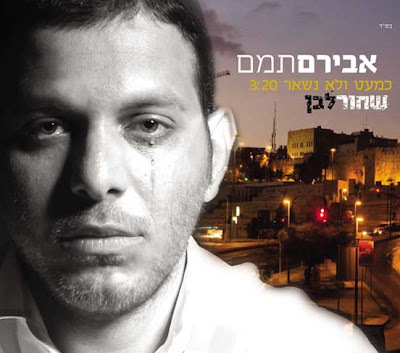 Just recently, Aviram finished work on his premiere album that tells the story of his amazing life. As one who has lived in two worlds, Aviram sees himself as an emissary sent to bridge and bring together the two opposing camps, unite the two streams of life with the language that talks to everyone-music. The album combines ethnic music with a touch of rock, on a firm foundation of Afro-American music. Original melodies and lyrics, the fruit of Aviram's creative pen, touch the depths of the heart and soul. As part of this fusion of two worlds, Aviram joined hands with his friends, top-ranked artists, Amir Benyon on banjo, Dudu Tasa, Aldad Tzitrin, Victor and Amir Pinto, with Shmulik Daniel from Hok Studio in charge of the musical production. Almost Nothing Remains is the first single, a song that evokes the nostalgic ache for "Jerusalem that was" and is full of the longing and yearning for the unification and building of Jerusalem. With the forthcoming release of the album, Aviram is appearing with his band in concerts around the country.